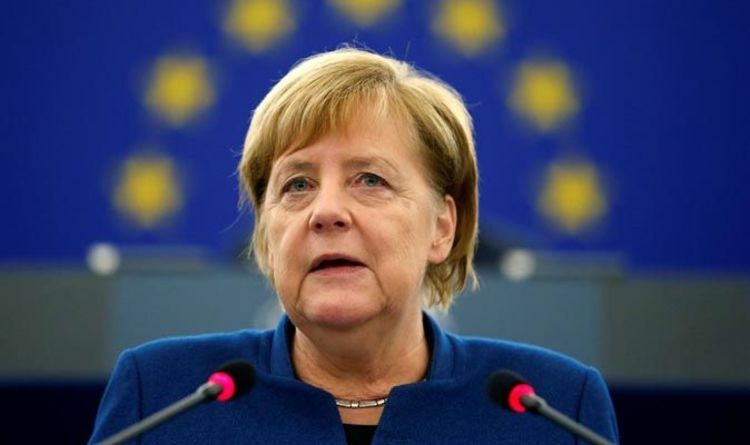 The German Chancellor told the European Union's Parliament of the damage done to the Brussels project after Britain decided to quit the bloc. Her statement came as part of a so-called 'Future of Europe' debate, where EU leaders are invited to Strasbourg to deliver a speech on their outlook for the bloc. Mrs Merkel was given a standing ovation by MEPs as she entered the chamber with the Parliament’s president Antoni Tajani. Mr Tajani thanked her for taking part in the "very important" debate, adding: "We need to change Europe but would be a big change to destroy Europe." The German Chancellor said: "The United Kingdom is a country that is soon leaving, this is a deep wound." She then praised Brussels negotatior Michel Barnier, adidng: "We can all applaud him for the work he has done." Mrs Merkel warned MEPs that the EU's values are being challenged by populists across the entire Continent. She said: "We are seeing our values called into question." Appealing for EU unity, she urged countries to work together more closely and ditch their "national egos" for the benefit of the bloc. She said: "Europe can only be a voice to the world if it works together. Therefor we have to overcome national egoism. "We took too long to realize the issue of refugees is a common problem in Europe. "Respecting others is not in contradiction with serving our self-interest." The German Chancellor admit her own mistakes in allowing over one million migrants into Germany during the 2015 migration crisis. She told MEPs, Germany should have pressed other member states to accept their own share of migrants. She said: "Took far too long, to realise the issue of refugees was an issue for the whole of Europe and not just Germany." During pauses in her speech, a number of MEPs can be heard booing. Mrs Merkel showed delight and said it was "great" that she was annoying people while in the EU Parliament. The German also backed French President Emmanuel Macron's call for a "real European army". She prompted heckles from the Ukip MEPs when she suggested Brussels should move to create a "true European army". She said: "We have to look at the vision of one day creating a real true European army. "I am not saying anything against NATO, we can be a supplement to NATO." Under her plans, there would be a 'European Security Council with a rotating presidency. Speaking after Mrs Merkel, Jean-Claude Juncker said: "we are not seeking to punish the UK." The European Commission President added: "Britain played a major role in the liberty and freedom of this Continent. "But this is not a reason to leave the great history between the British isles and the EU. "I think that leaving is a historical error." And once again, the end of Mr Juncker's speech was met with a number of heckles. The European People's Party's Manfred Weber discussed the "consequences" of Brexit, insisting the argument of Brexiteers had been "very fruitful" while demanding their sovereignty back. The German, who is vying to replace Mr Juncker as Commission President, said: "With Brexit, it has all shown us this argument – 'we want our soveringty back' – it works, it is very fruitful. "We need a new approach, we have to build a bridge between a decision-making process and the people."